Since you don't have to wait for an oven to heat up, this cornbread is super quick to make. Be sure to use a heavy skillet to prevent burning the bottom, and don't overcook. Check after 6 - 8 minutes. (It may take a few minutes more.) 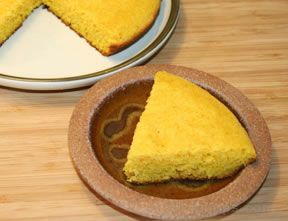 Cornbread has cooked long enough when firm around the edges and center is almost firm. Turn off heat and let stand, covered, for a few minutes. It will continue to cook. TIP: To sour milk, add 1 tablespoon vinegar to 1/2 cup milk and let stand for several minutes. 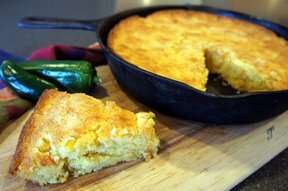 "This was a really easy and simple recipe for traditional cornbread. I don't have an oven or iron skillet but it worked wonderful!" 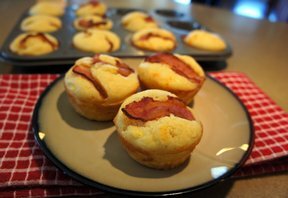 "Just made the recipe and it turned out great especially since my oven's out and needed something to go with pinto beans and ham. I had to improvise a bit because I didn't have the exact ingredients but followed the directions mostly. For the milk I used 1/4 cup whole milk and 1/4 cup 1/2&1/2 with 1 TSP distilled vinegar. The corn meal was stone ground which renders a bit of crunch to the end product. For oil I used coconut oil in the mix and in the pan. I was liberal for the oil in the pan. For sweetness I was used 2 table spoons sugar. The corn bread was cooked in an 10 inch ripping hot cast iron skillet with cast iron lid for 6 minutes with a few minutes rest. The corn bread was somewhat moist and held together well. It stayed at or around 1 inch thick. Given it lasted about 10 minutes eaten out of the pan I think its a winner. 5 stars because it filled the need, was quick and dirty and well received." 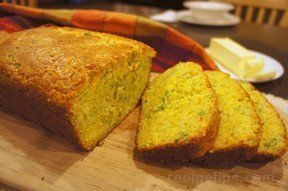 "I followed the recipe and found that it did not hold up to cornbread I have made in the past. Could this be due to the lack of regular flour in the recipe?"